2015 Kumpan 1954 L. Picture credits - Kumpan. Submit more pictures. The classic Kumpan comes with a digital speedometer, up to three removable LiFePo4 power packs, a �boost� function that briefly increases the power to up to 2800 W, cruise control as well as a USB charging socket in the lockable mobile phone pocket under the seat. 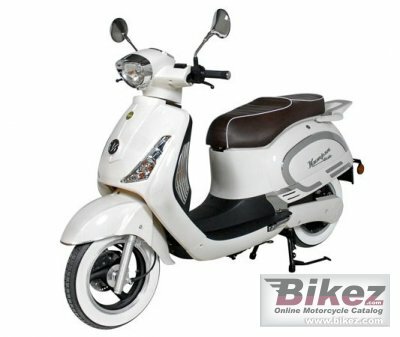 These and other exciting features await you in the new Kumpan 1954 L.
Color options: Cream white, deep black, chocolate, red. Comments: Range: 100 km. 1 - 2.5 hours charging time. Lithium iron phosphate (LiFePo4); 48V 18Ah/Battery. German brand. Ask questions Join the 15 Kumpan 1954 L discussion group or the general Kumpan discussion group. Bikez.com has a discussion group for every motorcycle. Here you may find answers to common questions about the model. If you do not find what you are looking for, you can ask questions. Try out the 2015 Kumpan 1954 L discussion forum. You can sign up for e-mail notifications when other users answer you. If you have information about any technical issue related to this motorcycle, please leave a comment for other riders.